Schakolad Chocolate Factory is the internationally acclaimed brand for fresh, handmade European style chocolates. Our signature chocolates are prepared with the finest ingredients and presented in the time honored traditions of quality, artistry and innovation. Schakolad offers a variety of delicious chocolate products including assorted boxed chocolates, chocolate novelties and sugar free and low carb chocolates. In addition, Schakolad also has sweet gifts for every occasion as well as coffee beverages offered at some locations. The Schakolad name (pronounced shaq-oh-LAD) is a combination of the name “Schaked”, after the company’s co-founder, Baruch Schaked, and “Chocolate”. The Schaked name represents three generations of chocolatiers who have been making chocolate since 1969, but the adventure really began when Baruch Schaked’s son Edgar scrapped his engineering career to keep the family’s passion alive after his father announced he was selling the shop and retiring. 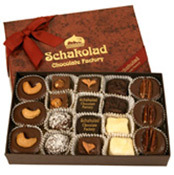 Thus, the first Schakolad Chocolate Factory was opened in 1995 in Winter Park, Florida. Imagine yourself being your own boss in this exciting business: running an upscale establishment and having fun while doing it! Schakolad Chocolate Factory will help you achieve this. With more than 40 years of experience in the chocolate manufacturing field, we will teach you in easy steps to make delicious chocolate. Schakolad began franchising their unique system in 1999, creating national and international awareness as the producers of fine quality chocolates using only the highest quality ingredients. Typical Schakolad stores range between 1,200-1,600 sq. ft. in size. In this space you'll be able to prepare and sell the most delicious and fresh chocolates you have ever tasted. One of the secrets of the Schakolad success is finding a high traffic location. The more people that see you making fresh confections in the "river of chocolate", the more customers you will attract. first franchisees of Schakolad Chocolate Factory, we would encourage any of you who want to own your own business to join this very impressive franchise system, as we believe this is the road to personal and professional success. The mission of Schakolad Chocolate Factory is to create the most superb chocolates by making them on premises using the finest raw materials. We wish to make Schakolad Chocolate Factory the premier chocolate maker in the U.S. and international markets. The Schakolad Chocolate Factory concept offers a unique opportunity for you to be your own boss with the guidance of a team of successful chocolate manufacturers who will help you through all the necessary steps. Schakolad Chocolate Factory is looking for people with commitment, responsibility and determination, who enjoy high quality chocolates and are customer oriented.